Our activity was introduced on the web"Jimoto Biiki." The ninth editors' meeting was held. Our activity was introduced on Toyama television "Toyama ikaga de SHOW." The third volume will be rereased on June 27. The seighth editors' meeting was held. We participate in "d47 MUSEUM FORUM 2014 culture magazine"
The seventh editors' meeting was held. The sixrth editors' meeting was held. We participate in "NIPPON ZINE! KAMI FES IN HIMEJI". The second volume will be rereased in June. The fifth editors' meeting was held. The fourth editors' meeting was held. The third editors' meeting was held. Our activity was introduced on NHK "Toyama oshirase tamago." Our activity was introduced on NHK "News Toyama-jin." Our activity was introduced on TULIP-TV "TULIP-TV news 6." We start registration of prior reservation of the first volume on August 31,2012. We start shipment of the first volume on September 4,2012. Our activity was introduced on Toyama television "BBT super news." The first volume will be rereased on September 4,2012. The second editors' meeting was held. 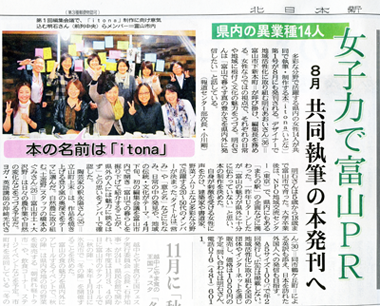 itona was covered by the local newspaper, Kitanihon Shimbun. Opening of itona web site. The first editors' meeting was held.